This is my second – last-minute! – contribution to the Robert Wise blog-athon, being hosted at the Octopus Cinema website. I’ve just re-watched this Western starring my favourite actor, James Cagney, which is the tale of a tough, driven owner of a horse ranch in Wyoming, and wanted to write down a few thoughts about it. This is a lavishly-produced film, in Cinemascope and Technicolor, with beautifully colourful, wide shots of the rolling grass prairies that almost take your breath away. The dazzling scenery does become disconcerting at times in the movie, as sometimes violent and disturbing events unfold against a backdrop almost as lovely as the Alps in Wise’s The Sound of Music (of course, bad things are happening inside the houses there too.) I suppose the contrast between the scenery and the events must be part of the point, but I’m not sure it always works all that well – sometimes I found myself wishing the lighting would be just a little less bright. I was interested to see this one because it’s a pre-Code (just) and also stars Spencer Tracy, an actor who I find extremely watchable. It’s also actually out on an official DVD. However, I must admit I was a bit disappointed with the film, directed by Henry King, as it is rather slow and also has a convoluted plot which I found hard to follow. The movie was originally intended as a star-making vehicle not for Tracy, but for French actress Ketti Gallian, who was being groomed for stardom by Fox at the time. She takes the title role as an innocent girl from a French village who is inadvertently kidnapped by a drunken ship’s captain. He abandons her somewhere in central America, and she makes her way to the Panama canal zone, where she starts to perform in a local nightclub, hoping to make enough money to get back home – but also runs into a variety of shady people working for different governments. The only person who believes in her is American doctor Crawbett (Tracy), who is in the area to carry out a study of tropical diseases, but gets caught up in the general plotting and paranoia. The film looks forward to Casablanca in its portrayal of a community of foreigners marooned in a small enclave where no one trusts anyone else, but the story doesn’t have nearly the same power or romance. Also, although Gallian is beautiful, she doesn’t really carry the film – partly because she has such a heavy French accent that she is hard to understand. I know heavy accents never stopped Garbo or Dietrich, but hers seems even stronger. I really want to see her acting in French, as I think she seems to come across better in the sequences where she speaks her own language, but there my problem is that there are no subtitles! I’ve now seen a number of 1930s American films with scenes in foreign languages and no subtitles, and am wondering when these started to come in. Tracy is good as ever, with the sort of stubborn personality he could play so well, but this isn’t one of his more memorable roles. For me the best parts of the film by far are the musical scenes in the nightclub. As well as Gallian singing, there are also torch songs from Helen Morgan of Showboat fame, again playing a drunken singer, and there’s also a black male singer who plays the piano and sings beautifully in an all-too brief scene – unfortunately I don’t know his name, but if anyone reads this who does, please let me know. All in all, a bit creaky, slow and hard to follow – but worth seeing for the music. Filmed in truly glorious Technicolor, this is probably the lightest of the Spencer Tracy and Katharine Hepburn movies I’ve seen so far. ( I only have a couple of the ones they made together still to go.) This time there’s no real sense of conflict – although obviously the romantic comedy plot brings up its share of misunderstandings – but more of friendship and shared humour, and sheer enjoyment of each other’s little eccentricities. The film is directed by Walter Lang, with a script by Henry and Phoebe Ephron, based on a play by William Marchant.As so often with movies based on stage plays, the dialogue is beautifully crisp, but this one doesn’t feel too slow and stagey. The plot seems extremely forward-looking for 1957, with Hepburn playing the woman in charge of a broadcasting station’s reference library, who fears she will be put out of work by a computer , invented by absent-minded boffin Tracy. Fifty years on, computers have, sadly, indeed put paid to such departments in some newspaper offices – I don’t know about broadcasters, but suspect it may be the same story there too. Anyway, the computer in this movie, EMERAC, nicknamed Emmie, is a magnificent sight, huge and taking up a whole room, with lights flashing and a selection of loud noises. My teenage son was most impressed to see it, and pointed out that it would have had a lot less power than a modern calculator! I enjoyed the scenes in the library over the Christmas period, where Hepburn is constantly answering the phone and saying: “Dasher and Dancer and Prancer and Vixen, Comet and Cupid and Donner and Blitzen.” Back in the 1980s, there used to be a list of Santa’s reindeer up on the wall in the reference library at a newspaper where I worked, because this exact query came so regularly over the festive season. In those days, and still more so in the 1950s, it seemed unlikely that a computer would ever be able to answer any random question you put to it. Now, of course, with the arrival of the internet, computers can do just that, and the science fiction has become reality. Hepburn provides the perfect contrast as quick-talking Bunny, with a memory at least equal to that of his computer.She might check her engagement diary for show, but you know she has it all by heart, and probably next year’s engagements too. I especially enjoyed the scene where Hepburn and Tracy eat a picnic in the cold while he fires questions from a prepared list. Among the supporting cast, it’s fun to see Joan Blondell in good form as one of Hepburn’s colleagues, while Gig Young is suitably infuriating as Hepburn’s on-off lover Mike, an unthinking male chauvinist who has taken her for granted for years until some competition turns up. I enjoyed the gentle, understated feeling to the whole movie – and, especially, the scenes where everyone is running around after Emmie the computer ! Following on from my posting about the silent 1920 version starring John Barrymore, here are some thoughts about the two talkies made in 1931 and 1941, starring Fredric March and Spencer Tracy. After watching the two talkies, I definitely think the Rouben Mamoulian version from 1931, starring Fredric March, is by far the stronger of the two, largely because, as it’s pre-code, it can be a lot more daring in sexual terms. This version amounts to a powerful attack on oppressive Victorian morality, making the story all about sexual repression. It’s suggested that Jekyll, who in this version, as in the Barrymore one, is again young and beautiful, is being driven to despair by being forced to undergo a long engagement to the virtuous Muriel (Rose Hobart). He is tempted to take on his second identity in order to have a sadistic affair with music hall singer/prostitute Ivy, leading to murderous violence. Something I liked about the movie was that it is sympathetic to Ivy, played by Miriam Hopkins, who is shown as beautiful and alluring and does her best to tempt Jekyll, but certainly isn’t dismissed as a “bad girl”. The scenes with Jekyll and Ivy in this version are the sexiest scenes in any of the three, I’d say – a shadowy outline of her swinging bare leg is still there in the next scene, showing how he is haunted by her. This is just one of the scenes which uses striking experimental effects, with another being the one where Jekyll first transforms into Hyde, a moment which is also one of the greatest sequences in the Barrymore version . The film might seem anti-feminist in that Muriel’s refusal to enter into a sexual relationship before marriage drives Jekyll/Hyde to his crimes – but, complicating this, she only rejects her lover because she is too dutiful a daughter to her overbearing father. 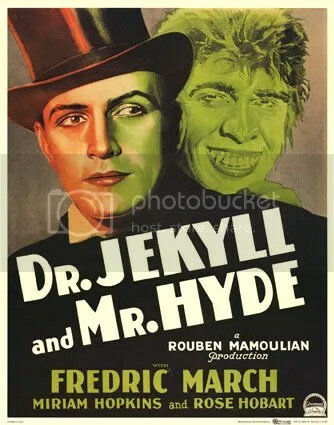 Unlike Barrymore or Spencer Tracy, whose features are still clearly there when transformed into Hyde, March looks unrecognisable. His heavy ape-like make-up is apparently to suggest that he is turning back into the beast beneath man’s civilised surface. There’s a lot of interesting discussion of the 1931 movie in ‘Dangerous Men’, by Mick LaSalle – unfortunately I’ve taken this back to the library, but I remember that he looks at the film in the context of March’s other pre-code films, which often see him suffering from alcoholism, in tears and caught in a spiral of self-destruction. I’d be fascinated to see a few of these. LaSalle says that March says the line “I’m in hell”, which in this film he speaks to Muriel, in several other movies too. I do find his performance powerful and can see why he won the Oscar, though for me Barrymore is even better. 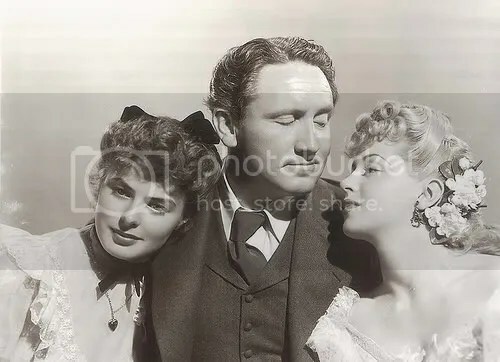 The Victor Fleming version of 1941, starring Spencer Tracy, seems rather weak and watered-down by comparison – there isn’t as much openness about sexual repression, although the opening, with a man screaming out abuse in a church, struck me as quite disturbing. Again, Jekyll is torn between “good” and “bad” women, but in this version Ivy (Ingrid Bergman) is a barmaid and singer without any suggestion that she is a prostitute, something made clear in the pre-code version. For me the biggest problem with this version is that Tracy is miscast. I do usually like him as an actor, and think he is fine in the scenes as Jekyll, where basically he just plays the sort of character he usually plays – tough and slightly world-weary, with a sort of abrupt charm. But things go wrong as soon as he turns into Hyde. Unlike both Barrymore and March, he doesn’t have the sort of volatility to make him believable as a snarling psycho – he just seems to be going over the top, and it doesn’t help that he hardly has any make-up and still looks like himself! I feel pretty much the same about Tracy in this film as I do about Bogart (one of my very favourite actors) in another horror film, The Two Mrs Carrolls, where Bogie plays a tortured painter with a split personality – he too is fine in the more realistic scenes, but not where he has to chew the scenery and turn into a psycho. There’s the feeling of the studios shoe-horning both these fine actors into roles which just weren’t suited to their talents. At first I thought Ingrid Bergman had been miscast, too – her attempt at a Cockney accent is wildly unconvincing, with every third word sounding Swedish. (Tracy sticks to his usual accent.) But after a minute or two, it’s clear this doesn’t matter – I think she is brilliant as Ivy, giving a shimmering intensity to her role, and seeming so terrified of Hyde that she makes him frightening to the audience. I’ve read that Bergman was originally supposed to play the good girl, Jekyll’s fiancee Beatrix, but wanted more of a challenge and swapped parts with Lana Turner. If this is true, then I definitely think Bergman made the right choice – for me this version is her film all the way. Turner is also fine as Beatrix, but has far less scope. Seeing this was a pre-code movie about the notoriously tough prison in New York, directed by the great Michael Curtiz, I expected a disturbing, no-holds barred film, maybe something even tougher than the prison scenes in Each Dawn I Die. So I was a bit surprised at how tame this film often feels by comparison with that movie, made just seven years later. By contrast with the snarling, brutal warders in Each Dawn I Die, the guards in 20,000 Years seem quite well-meaning, while the warden himself – played by Arthur Byron – is positively saintly, and only interested in reforming and helping his “boys”, rather than in sadistically exercising his power over them. As I watched the film, I kept on wondering why the warden was painted in such glowing colours, and only realised the answer when I discovered that the movie is based on a book written by his real-life original, Lewis Lawes – who also had final script approval. To be fair, he does appear to have been a genuine reformer. The title is based on adding up all the terms being served by the men in the prison, as the opening and closing titles make clear.